An unmanned Japanese cargo spaceship safely arrived at the International Space Station today (Jan. 27), successfully delivering tons of provisions for the station and its crewmembers. The gleaming robotic cargo ship Kounotori 2 flawlessly pulled up to the station this morning, drawing close enough so astronauts inside the outpost could latch onto it with a robotic arm. Station astronauts Cady Coleman and Paolo Nespoli maneuvered the station's robotic arm to grab the cylindrical Kounotori 2 vehicle as it came within 33 feet (10 meters) of the space station. They then worked to attach it to the Earth-facing port of the Harmony module. The successful capture of Kounotori 2 (also known as H-2 Transfer Vehicle 2, or HTV-2) was confirmed at 6:41 a.m. EST (1141 GMT). "We have HTV-2 in our grasp," said NASA astronaut Cady Coleman. The station crew then slowly and methodically moved the cargo ship to the spacecraft's berth at the bottom side of the Harmony node, using the station's Canadarm2 robotic arm. 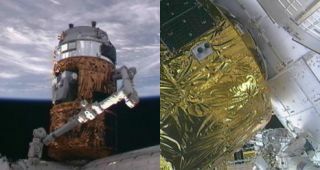 Sixteen bolts were driven in place to secure the HTV-2 to the space station. The official attachment time was recorded at 9:51 a.m. EST (1451 GMT). Kounotori 2 is the second spacecraft built by the Japanese Aerospace Exploration Agency (JAXA). The vehicles' name, "Kounotori," means "white stork" in Japanese. Kounotori 2 launched to the station from Japan's Tanegashima Space Center on Jan. 22 at 2:37 p.m. Japan Standard Time (12:37 a.m. EST, 0537 GMT), riding into orbit atop an expendable H-2B rocket.The robot cargo craft is a gold cylinder about 33 feet (10 m) long and 14 feet (4.4 m) wide. It is packed with 5.3 tons of supplies for the orbiting laboratory, including fresh food, water and science experiments. The cargo vessel will likely remain attached to the station for about 40 days. During that time, it will be filled with trash, and detached at the end of March to burn up as it re-enters Earth's atmosphere, officials have said. This is the second voyage for Japan's orbital spacecraft fleet. The first Kounotori cargo ship flew to the space station in September 2009. Japan's fleet of HTVs is part of a growing suite of internationally built unmanned cargo spaceships that help supply the International Space Station. Following the retirement of NASA's astronaut-carrying space shuttles later this year, these robotic cargo ships will play a vital role in re-stocking the outpost for its live-in crews, officials have said.